Every year the leisure industry puts on a spectacular array of shows and exhibitions where enthusiasts can browse the brand new latest models or a selection of quality used vehicles. This year is no different! I am writing this at the beginning of June 2014, we have already seen a large number of really exciting shows so far. If you haven’t been able to visit one this year you need to put some of these dates in your calendar. The Motorhome Show will be held at the Stratford Racecourse for the 27th tear this year. The show is on for 3 days and you can expect a huge range of exhibitors to be present including; individual dealerships, accessory shops, gadget shops, insurance companies and much more. If you decide to stay overnight, you can enjoy the 2 nights of free entertainment and even enter your prized pet into a competition! This is a brand new show for 2014 and conveniently taking place mid-season. If you're interested in buying your first motorhome or trading up then this could be a good place to visit. Attending the show are some of the largest motorhome dealers in the country so you can be sure there will be no shortage of motorhomes to look round. Among the dealer stands, there will also be leisurewear, food stalls and related retailers exhibiting. Tickets are only £5 and the 1st 1,000 to book get a free "Buying Your First Motorhome" guide - can't be bad! The Western Motorhome Show is returning to the Three Counties Showground, Malvern in August this year. If you haven't been before then let me tell you a bit about it. The show is about motorhomes, but with a "Western" theme. Expect to see plenty of cow boys and listen to country music. The organisers promise over 200 exhibitors and up to 4 nights of entertainment for campers. If you don't fancy staying for the whole show, you can just go as a day visitor. The show organiser claim this is THE show in autumn for all caravan and motorhome owners. I've never been myself, but I have heard good things about it. You can expect to see over 130 trade stands including caravan & motorhome dealers so there will be plenty to look at. You can visit for the day or the whole weekend. Obviously you bring your caravan, motorhome or tent as your accommodation. The Lawns Show is probably the first opportunity the public get a look at next season's models of new touring and static caravans. Most of the mainstream manufacturers attend the show which is based in the grounds of the Hull university (just around the corner from the Swift factory). Parking is free and tickets are very affordable at only £3 per person or £7 for a family. The Motorhome Show that takes place in September is the famous Shepton Mallet motorhome show. It is absolutely huge with no shortage of new and used motorhomes to browse at your leisure. You will also be able to browse accessory stalls among other related retail stalls. You can attend the show as a day visitor or camp for the weekend, whichever suits you best. Held at the Lincolnshire Showground, the Season Finale Show is definitely one to visit. The organisers really go to town on the displays and entertainment for the weekend. One of the most recent displays confirmed for the show is a Spitfire Display! Weekend camping is encouraged and day visitors are welcomed to the show. 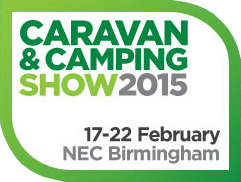 This is without doubt the largest caravan, motorhome and camping show of the year. It is held at the Birmingham National Exhibition Centre across 5 halls. The show is backed by all of the major caravan, motorhome and static caravan manufacturers which means you can see pretty much everything in one place. If you can only make it to one show this year, this is the one I recommend. It takes place from Tuesday through till Sunday. At the show there's more than just caravans and motorhomes to see; all of the big industry clubs attend as well as accessory retailers and informative seminars are held presented by industry experts. There are lots of local caravan sites which you can stay at. If you have a lot to look at you can always get a pass for the week! I’m sure there will be some other really great shows throughout the course of the year, but these are some of the main ones. Have you ever attended any of these shows? Share your thoughts and experience in the comments below to help others decide which ones to attend. That’s it for this post folks.